Keep a souvenir of your memories. See them hanging on your walls, in an album on your coffee table rather than on your computer screen. How many times in recent years have you watched your photos on your computer? Do you often sort your pictures you take with your phone? Have you ever been a “victim” of a loss of all your digital data or a theft / burglary that caused you to lose your hard drive? I think you get my idea. Photos don’t have to stay on a hard drive or a USB key somewhere (we often forget the “where”). The photos are made to revive the moment and for that, you have to have them one way or another printed. I spend my time flipping through my family albums, framing some large photos, while smaller ones are scattered around my home or in my bag I have everyday. I am convinced that all these beautiful emotions deserve to be kept on beautiful supports. You have to admit that a beautiful picture of your children laughing printed and framed in your lobby will give you a great smile for the day?! I suggest you different ways to keep track of your memories. You will be able to look at them, show them to your family, and even pass them on to your children one day (but not immediately, be selfish for now). And as I know we sometimes find some good ideas on the internet but how disappointed we can be with the quality after, for these ones, I promise, I chose some great suppliers that make great things. I chose to offer handmade albums, with buckram covers (cotton and linen textiles) and 800g thick pages. The opening is flat so you can look at it together on a table and have beautiful and large images. Your job is to select the photos, I then take care of the layout and the shipping (with your validation before).It will be able to stay in time and your children will have the pleasure of leafing in turn when they are adults. These albums are really ideal for keeping track of an important moment in your life like your marriage. I propose them in three formats, all squares: in 20×20 cm, 25×25 cm and finally in 30x30cm. Same covers and pages as high-end albums, these albums are made for sessions (family, couple, portraits or friends). The opening is also flat. The main difference? A maximum of 10 pages (5 sheets), so a smaller selection of photos. I offer these albums in two formats, again square: 15x15cm and 20x20cm. It’s certainly the product that we are most used to seeing, but what a pleasure to touch the photo on a paper, to frame your images and watch them daily at home. Again, I offer prints of great quality, with a gloss finish. My supplier is in Paris and can deliver me super quickly (half day if the schedules are respected) if you have a special need. I was able to check my colors with them upstream and thus ensure you to offer the best product possible. Feel free to ask me the details of sizes & prices. You make your selection, I do the rest. Know that I offer discount codes in partnership with Atelier Rosemood. 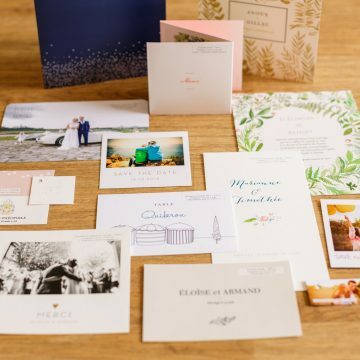 This company, based in Nantes, offers tailor-made invitations and stationery, with many designs, all accompanied by top-notch customer service.